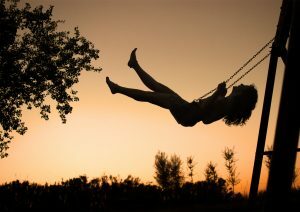 The sensation of swinging is that of both freedom and dependency; as you fall through the air, you can feel excited and terrified at once. Like a swing, this sweet little poem shifts, connecting us to the feelings of “panic and delight” that Kinsella so gracefully describes. When I drop from sight.